Responding to editors’ requests for a regular sampling of current commentary from around the Catholic press, here is an unsigned editorial titled “Spiritual vs. religious” from the May 15 issue of The Tablet, newspaper of the Diocese of Brooklyn, N.Y.
Research shows the number of Americans not identifying with any religion is rising rapidly. A 2012 Pew Research Center survey finds that this large and growing group (32 percent of “under 30s”) mostly believes in God (68 percent) and often feels a deep connection with the earth and nature (58 percent). One in five say they pray every day. About a third describe themselves as “spiritual but not religious.” Overwhelmingly, they think that religious organizations are too concerned with money and power, too focused on rules and too involved in politics. 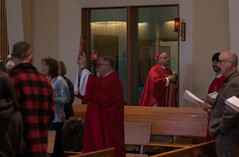 Is it OK for a Catholic to be “spiritual, but not religious?” Many seem to think so and would take great offense at a suggestion that their infrequent church attendance is any sign of weak faith or an outright rejection of the church. Ironically, it is precisely a certain organizational sophistication — which inevitably involves prudent management of financial, technological and political capital — that enables so many good works to be accomplished. What are we to make of this? If to be “spiritual” means to shy from connections with the things of the world or with other human beings, then we are dealing with a dualistic, almost puritanical world view where matter is a hindrance to spirit. This does not seem to be where the “spiritual, not religious” people are at. They are not at all withdrawn from the world. On the contrary, relationships are very important to them. They value honesty and open-mindedness, and they want their lives to make a difference in the world. Rightly or wrongly — and this may be their own form of stereotyping — they may suspect “religious” types of being judgmental, rigid in their thinking, not very tolerant of anyone with an “alternate lifestyle” and, ultimately, superficial for focusing on ritual and external behavior. If anything, the “spiritual, not religious” folks may be closer to the heart — if not the ideal practice — of the faith than they (or their detractors) imagine. If what they feel alien to is not God, other people or even religion but rather an impersonal, self-righteous, excessively bureaucratic and inwardly focused kind of religiosity, then they would seem to be on roughly the same page as Jesus himself who was often critical of the pharisaical, pretentious mentalities of his time. If they yearn for a church readier to forgive than to condemn, more impelled to mingling with people than counting them, more anxious to listen than to be heard and less defensive of its own shortcomings, then of what heresy could they be charged? The possibility exists that by “spiritual,” some might intend a private, “Jesus and me” kind of individualism that fails to appreciate how deeply the Incarnation connects God to our humanity. Jesus spent virtually all his public ministry engaged in the lives of people who were broken, sinful, rejected and alienated. He touched, healed, exhorted, admonished and instructed so as to restore people to full spiritual, emotional and physical health — and to their families and communities. He is the great connector. All of this is what the church is (or should) be about, too. Jesus prayed, alone at times, but often at the temple. He encouraged observance, never rejecting or even withdrawing from religious practice himself, though he drew sharp contrasts between moral duties and merely ritual (man-made) observances. Was Jesus really more “spiritual” when he went up a mountain or fled into the desert than he was in restoring sight to the blind, hearing to the deaf, freedom to those possessed? At the Last Supper, in giving us a ritual to perpetualize the gift of his body and blood, our food and drink for eternal life, did he give us something only “religious” and not profoundly spiritual? 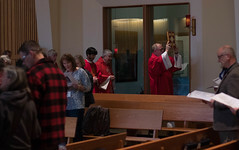 Young people or anyone else seeking a deeper spiritual connection can become more “spiritual” by following the example of Jesus himself, more and not less involved in a church family that performs the “spiritual” and “corporal” works of mercy, not just “religious” rituals. Nor need anyone who feels strongly about being “spiritual, not religious” bury their rich treasure of vision and passion in fear but rather stand up with courage and rally the old church to fulfill its true potential!